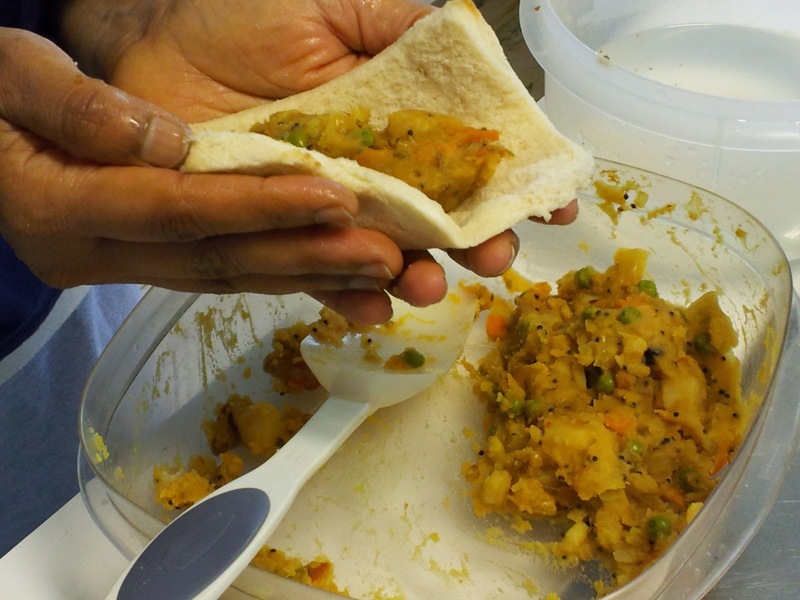 Indian Khana, Made Easy: Masala Bread Pakora - A Hearty Winter Treat! Masala Bread Pakora - A Hearty Winter Treat! What do Mr. 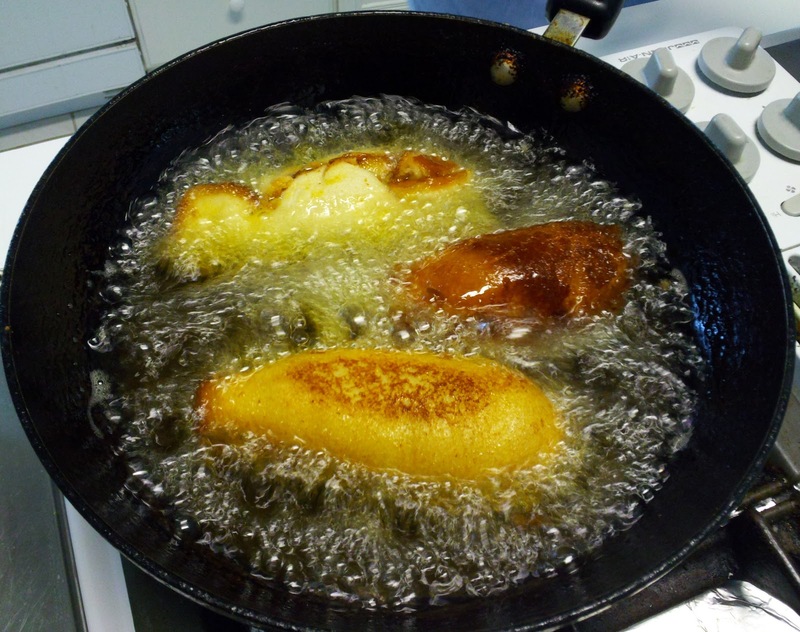 Potato Head, the Hot Potato game, and Fried Oreos & Twinkies have in common? These are some things we grew up with and still enjoy today. I remember my first time eating a fried Oreo? It was at a street festival in Little Italy, New York City. It was an interesting experience to say the least, but I enjoyed it. I added it to the many food memories I accumulated through the years. The appetizer pictured below is from one of my mom's foodie memories. She had it at an eatery long ago in India and has been making it for us every since. 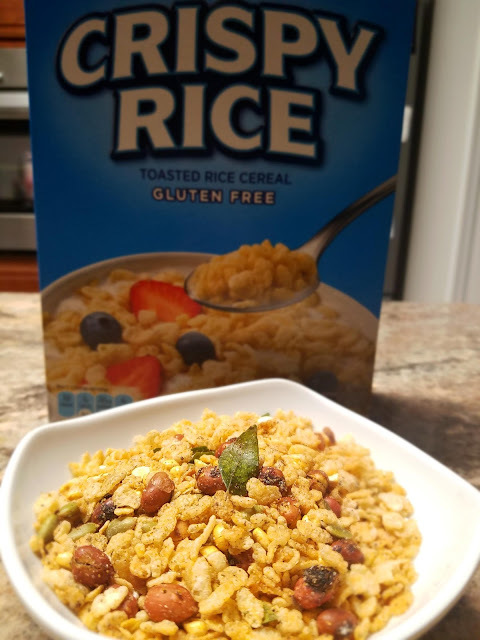 It is actually one of my sister's favorite treats to eat when she comes home for the holidays. It's called Masala Bread Pakora! And the best part is that the crust is made using a slice of white bread. No need to make it from scratch. Picture to be posted soon!! Cook potatoes in the microwave until soft (6 to 7 minutes) and peel off the skin. Then cut or mash roughly to 1 inch pieces and set aside. Heat 2 tablespoons of oil in a saucepan and add the cumin and mustard seeds. When they splutter, add onions and sauté for one to two minutes. Now add turmeric and then toss in the tomatoes, allowing them to soften. Next add the green chilies and salt. Mix well. Add in the mashed potatoes and carrots and peas, mix and cook for 5 minutes under closed lid. Later add lemon juice, chat masala and mix well. Finally, add the chopped coriander after removing from stove and mix again. Cool the vegetable curry for 10 minutes. 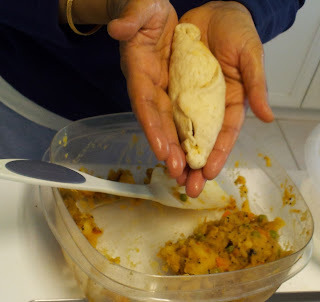 Take a bread slice and moisten it slightly with water and place a quarter cup or ladle of the curry on the bread in the center diagonally and cover it with bread by pressing with your fingers (as shown in the picture below). Use wet fingers if necessary to moisten the bread. Heat oil in the frying pan and fry the stuffed bread until golden brown (for 3 to 4 minutes) by turning sides for even frying. 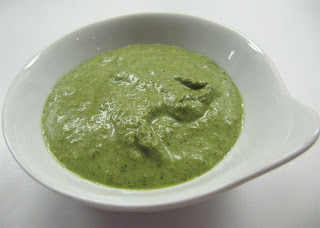 Serve hot with coriander chutney (recipe below). Finely chop a small bunch of coriander. Roast quarter cup of peanuts. In a blender, grind the peanuts into a fine powder, then add the chopped coriander, one clove of garlic (husked), 2 green chilies (chopped finely), 1 teaspoon of tamarind paste, half teaspoon of salt and some water. Blend to a smooth paste. I love this post! I totally miss Mr. Potato Head from childhood! Cooking those dishes from our childhoods are so fantastic. My Dad is Polish so we make pierogi's when we get together along with other random, different culture foods. You made the Pakora seem simple enough to make. I'm going to have to try this.